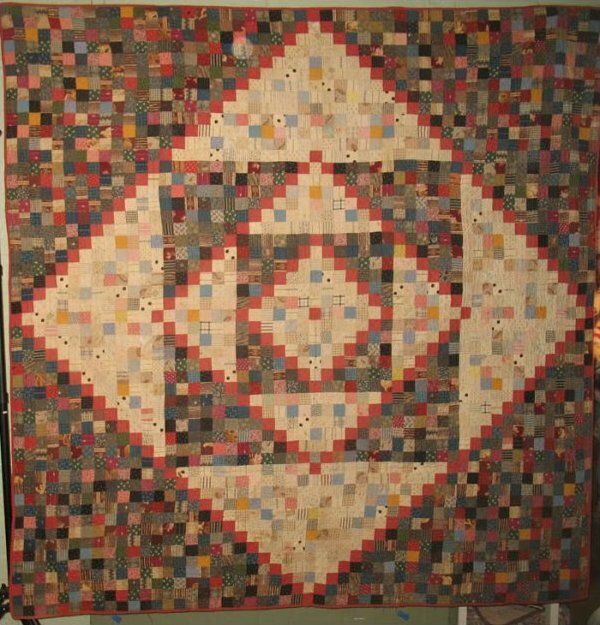 Quilts > 19th CENTURY QUILTS > BOWMANSVILLE DIAMONDS IN SQUARES ANTIQUE QUILT, PA.
A tradition in quilt design and composition emerging from this particular Lancaster County, PA community. Quilt makers pieced small squares of printed cottons and arranged their light and dark tones to create bolder graphic patterns featuring a center medallion format. Shaded squares and diamonds of increasing proportion form a pattern visible from a long distance that also intrigues close up because of the many varied late 19th century prints combined so deftly. Note how the large segments are 'outlined' by red piecing .